Earwigs feed on live and dead plants and tiny insects. At times they damage cultivated plants. They will occasionally damages vegetables, flowers, fruits, ornamental shrubs, and trees, and has been recorded as feeding on honey in beehives. 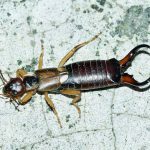 Earwigs have a distinctive disagreeable odor, which is released when they are crushed, but some species can squirt such a liquid. They are gregarious in nature, typically occurring in groups. Earwigs often invade homes, sometimes by the hundreds or thousands. Earwigs are attracted to lights or to insects attracted to lights. They may enter weep holes through brick facing and beneath siding along the foundation. They also bridge from tree and shrub branches in contact with building surfaces. The key to control is the removal of unessential mulch, plant debris, and objects such as stones and boards from around the structure. The purpose of this is to establish a low-moisture zone, which is disagreeable to earwigs.